To start at the beginning, Exeter’s Exploding Bakery was always one of my favourite places and made a very early appearance on the Coffee Spot, being just the 20th place that I wrote about after I visited in 2012. Back then it was definitely a bakery that served coffee, with a couple of tables and an espresso machine tucked into a busy, thriving bakery, baristas and bakers sharing the space. When I ran into the guys from the Exploding Bakery at the Caffè Culture Show in 2015, they excitedly told me about all the changes that they had made, leaving me itching for a return. However, Exeter isn’t somewhere that you casually pass by (not if you live in Guildford, anyway), so it wasn’t until January of this year, when I was on my way down to Torquay, that I had the opportunity to pop in and say hello the new-look Exploding Bakery. September 2016: The Exploding Bakery has expanded once again, taking over the adjacent unit. You can still sit in the bakery and drink your coffee, but you’ll find the counter and most of the seating one door over to the right. I described the original Exploding Bakery (which recently celebrated its fifth birthday) as a bakery that happened to serve coffee. This is no longer the case. Whereas before, you were very definitely in a working bakery, with a couple of tables squeezed in to the right of the door and an (old) espresso machine on a counter top against the left-hand wall, now you’re in a coffee shop, which just happens to have a bakery attached. In fairness, the transformation’s not that great in terms of actual layout, but in terms of impact, it’s huge. While I liked the charm of the old place, it really was small and cramped and, for the barista, probably not that much fun to work in. Now there’s a proper counter, which is directly ahead of you as you come in, plus there’s a more seating, in the shape of a four-person table to the left (where the old cake display used to be) and a large, communal table to the right. There are also four large tables with benches outside on the pavement, giving the Exploding Bakery much more of a street presence. No danger of me walking past without noticing it now! The bakery is still there and still working (except on a Friday, which, of course, is when I was there! ), but now it feels more distinct, which is probably a good thing. However, if you like watching bakers at work, then the Exploding Bakery is still the place for you! The other major upgrade has been on the coffee-side of things itself. 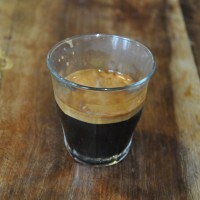 The Exploding Bakery still uses Monmouth as its house espresso, but now there are guests on the second espresso grinder. The Exploding Bakery regularly offers the likes of London’s Campbell & Syme, Bath’s Round Hill Roastery, Bristol’s Clifton Coffee Roasters and old friends of the Coffee Spot, Horsham Coffee Roaster. As well as the second grinder, the Exploding Bakery now does filter coffee through the V60, again with a rotating cast of roasters. While I was there, the filter was a Kenyan from Clifton, while the guest espresso was another Kenyan, this time from slightly further afield, Denmark’s La Cabra. I had a lovely flat white, which, at the barista’s recommendation, was made with the house espresso. The coffee and milk combined perfectly and the result was a very smooth, well-balanced drink. Naturally I was spoiled for choice when it came to cake, so once again, I went with my barista’s recommendation, in this case a seeded flapjack. This was ridiculously good, with loads of seeds and a chewy consistency that made it so easy to eat since it never once fell apart. So good to be back! Don’t forget the original Exploding Bakery Coffee Spot, which includes the complete write-up and a new gallery, along with the original write-up and gallery. This entry was posted in Bakeries, Cake, Coffee Shops, Coffee Spot Updates, Exeter, Laptop Friendly, Lunch, Sandwiches, Stations Nearby and tagged include by Brian Williams. Bookmark the permalink.